Purpose: The objective of this study was to correlate the degree of myocardial fluorodeoxyglucose (FDG) uptake in routine oncology positron emission tomography (PET) studies with fasting blood sugar level (FBSL), fasting period (FP) and age of the patient. Materials and Methods: Ninety-one patients (62 males and 29 females, age range: 7-78 years) with malignant diseases were included in the study. Whole body FDF-PET study was carried out after 1 h of intravenous injection of 296-370 MBq (8-10 mCi) F-18 FDG. Images were interpreted visually and patients were classified into four grades of myocardial uptake: No myocardial uptake = Grade 0; mild uptake = Grade 1; moderate uptake = Grade 2; and Marked uptake = Grade 3. Quantitative analysis was done by calculating Standardized uptake value (SUV max). Age, FBSL and FP were recorded. Results: Thirty-seven (41%) patients showed no uptake in myocardium (Gr-0). Mean FP, FBSL and age was 14 h, 94.19 mg% and 44.3 years respectively. Eleven (12%) cases were rated as Grade 1, 27 (30%) as Grade 2 and 16 (17%) as Grade 3. The mean values of FP, FBSL and age were 12.9 h, 96.55 mg% and 43.54 years for Grade 1, 13.48 h, 87.11 mg% and 40.85 years for Grade 2 and 13.37 h, 86.56 mg% and 36.18 years for Grade 3 respectively. SUV max was found to vary between 1 and 22. It was observed that 47% (Grade 2 and 3) patients had significant cardiac FDG uptake in spite of blood sugar levels 71-125 mg%. Conclusion: The degree of myocardial FDG uptake did not show significant correlation with FBSL, FP or age of the patient. Perhaps the reason lies elsewhere like insulin levels, medical treatments, fat metabolism, and myocardium status or some unexplored factors. Aims: The reported prevalence of osteoarthritis (OA) varies according to the method that is used to detect it. X-rays are commonly used in the diagnosis of OA. However, marked osteoarthritic damage must be present to detect characteristic changes with radiologic imaging. Our intention was to evaluate bone scans (1) he occurrence of such changes, (2) he incidence of OA (single or multiple joints) in the general population (a mixture of urban and rural) who were asymptomatic. Data on OA incidence in India is sketchy and sparse as against more detailed information obtained from USA and European nations. Also, clinical rheumatologists are not well-versed with the potential application of bone scans in the management of arthritides. Materials and Methods: Two hundred and eighty nine planar images of routine bone scans were randomly evaluated by two trained nuclear medicine physicians. The ages of the patients ranged from 20 to over 80 years. Results: It is observed that as the age increases, the incidence of joint involvement increases. However, it is worth noting that even in the age group of 20-40 years, as many as 34% of asymptomatic persons have involvement of the joints. In this age group, as the manifestation is probably in the inception stage, there is a tendency for single joint involvement as against multiple joints seen in the older age groups. Another point to note is that the incidence of joint involvement was not affected by weight. In our patient population, gross obesity was not seen. The predominant joints involved are the knees and hips, followed by the shoulders and ankles. Females show a higher incidence than males. Some patients would be having only a single site or multiple site involvement. This observation is important as in a single, simple test whole body survey gives more information with low radiation burden. Conclusion: Scintigraphic prevalence of OA is higher than reported in US, Europe, and Asia as this test is more sensitive in detecting early changes as compared to radiological changes. These findings on scintigraphy in asymptomatic cases have not been described to the best of our knowledge. Epidemiological demography in published reports is based on clinical or radiological changes observed in single joints which are predominantly symptomatic and multiple joint involvement is rarely recorded. The sensitivity of scintigraphy to show early changes in bone homeostasis and remodeling needs to be exploited. Introduction: Radionuclide bone scan (BS) used to be the investigation of choice for detecting osseous metastases in prostate cancer. Now, with the availability serum prostate specific antigen (PSA) testing, clinicians do have a timely, cost-effective method to determine those patients who are highly unlikely to have osseous metastases. We determine the utility of PSA for predicting the presence of skeletal metastasis on BSs in prostate cancer patients. Materials and Methods: Retrospective analysis of medical records of 322 consecutive prostate cancers patients subjected to BS during the last 3 years was done. 52 cases were excluded due to following reasons: Serum PSA not available, hormonal or other therapy given prior to serum PSA measurement, and/or BS, and symptomatic for bone metastasis. In remaining 270 cases, PSA value and BS were evaluated. BS was performed with Tc99m methylene diphosphonate (MDP) as per the standard protocol. Results: BS was found to be positive in 153/270 (56%) and negative in 117 (46%) patients. Of the 153 positive cases, 108 (70%) had serum PSA > 100 ng/ml, 42 (28%) had PSA of 20-100 ng/ml and only 3 (2%) had PSA < 20 ng/ml. All the patients with PSA > 100 ng/ml had multiple skeletal metastasis. Of the 117 negative cases, 110 (94%) had a PSA < 20 ng/ml, 5 had between 20 and 100 ng/ml and only 2 (1.8%) had PSA > 100 ng/ml. Of the 113 patients with serum PSA < 20 ng/ml, 110 (97.4%) did not show any bony metastasis. 150/157 (95.5%) patients with PSA > 20 ng/ml had bone metastasis. Using this criterion, 110 (40.7%) scans would have been omitted. Conclusions: Serum PSA < 20 ng/ml have high predictive value in ruling out skeletal metastasis. Our data are in corroboration with results from previous studies that BS should be performed only if PSA > 20 ng/ml. Using this cut-off, unnecessary investigation can be avoided. Avoiding BS in this group of patients would translate into a significant cost-saving and reduction in their psychological and physical burden. Purpose of the Study: The purpose of the present study is to find out the correlation between the glomerular filtration rate (GFR by Gates gamma camera method) and serum creatinine clearance (SCrCl by Cockcroft and Gault's method) within ± 3 weeks' time difference. Materials and Methods: Study design retrospectively in 59 patients with serum creatinine value calculated for SCrCl with Cockcroft and Gault's formula as an index parameter for kidney function underwent the 99m-Technitium labeled Di-ethyl Triamine Penta Acetic Acid (99mTc-DTPA) renogram with ECIL planar gamma camera. Results: All data of 59 patients has been divided into Group- I, II, and III based on the time difference of serum creatinine test from 99mTc-DTPA renal GFR tests performed on the same subjects. Serum Creatinine test was carried out within ± 3 days, between ± 4 days and ± 7 days, and between ± 8 days and ± 21 days from the DTPA GFR Test performed in the Group-I, II, and III respectively. Correlation coefficient of Group-I (n = 15) patients showed 0.8198 and P value < 0.001 for GFR and S. Creatinine within ± 3 days. Group-II ( n = 17) and Group-III (n = 27) patients having correlation coefficient 0.6194 and 0.589 and P value <0.01 respectively, within ± 21 days. The two methods gave almost identical estimate of GFR even at 3 weeks interval. Conclusions: Study concludes that SCrCl using Cockcroft and Gault's formula could serve as an instant, easy, and reliable method for assessing kidney function. SCrCl with Cockcroft and Gault's formula is more useful for rapid estimation of global GFR for those patients who are not accessible to DTPA renogram with gamma camera. Correlation can be established further with the prospective study in various renal pathophysiological conditions. Purpose: To develop a spreadsheet program for estimation of recovery coefficient (RC) to get partial volume corrected (PVC) standardized uptake value (SUV) in clinical positron emission tomography-computed tomography (PET-CT) studies. Materials and Methods: For formulation of this program we used data from a phantom study conducted at our center in which a phantom with a sphere assembly (seven spheres-different diameters) was filled with 18F-Fluorodeoxyglucose solution to get a sphere/background ratio of 8:1, 10:1 and 12:1. 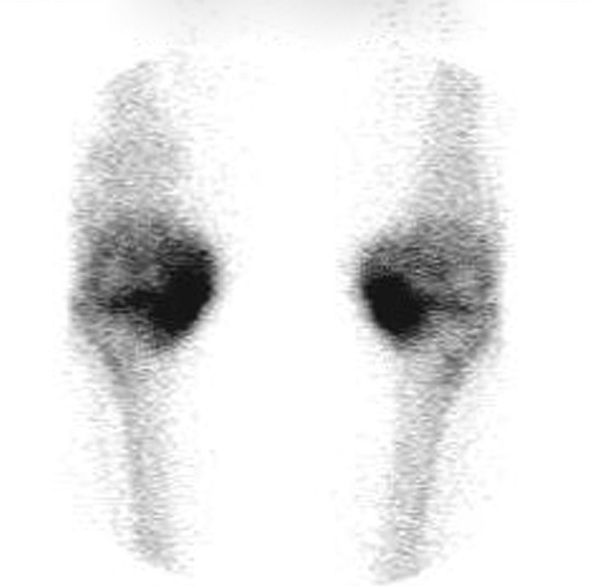 PET-CT images were acquired. 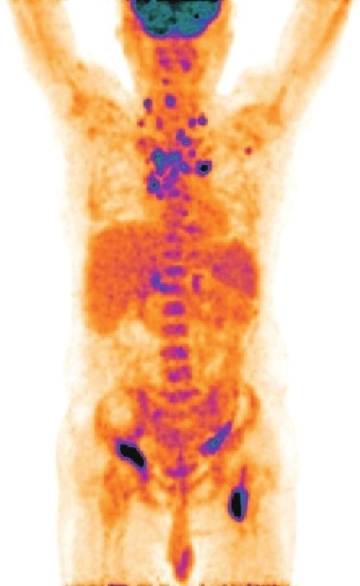 RC was then calculated from processed PET-CT images. We plotted graph of RC versus lesion-size at different sphere/background ratio using MS Excel function. There was logarithmic increase in RC with increase in lesion size. We fitted the data with a logarithmic equation and found optimum fit (least-square fit).We then validated this program with clinical data using 42 lung nodules in five patients. Results : The program estimates the value of RC and object to background ratio in PET-CT for the input lesion-size and displays graph with trendline. When the user enters SUV and background activity measured in clinical PET-CT, it provides the value of RC and PVC SUV. It also validates the data entry and displays appropriate message. It is consistent, reproducible, accurate and provides output for wide range of lesion-sizes (71% of lesions evaluated); however, program does not give output for lesion-size < 9 mm. Conclusion: The present spreadsheet program is a useful and easy tool for calculating PVC SUV of clinical PET-CT lesions. 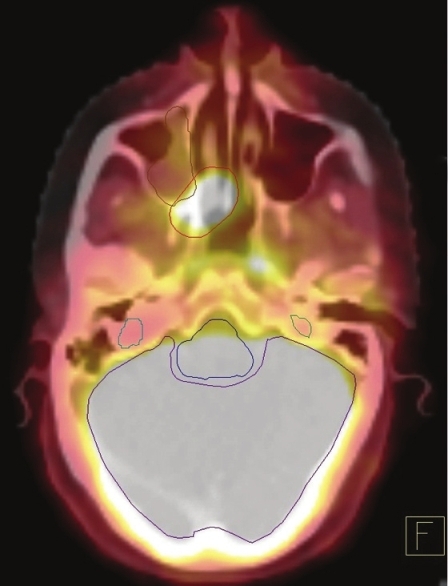 Purpose: To compare quantitatively Gross tumor volume (GTV), both primary and nodal areas of head and neck cancers, delineated on [18F]-2fluoro, 2deoxy d-glucose-positron emission tomography/computed tomography ([18F]-FDG-PET-CT) scan to those delineated on Contrast-enhanced CT scan (CECT scan). Methods: A total of 26 consecutive patients with squamous cell cancers of head and neck were included in this study. The primary sites were oropharynx ( n = 7), hypopharynx ( n = 6), paranasal sinus ( n = 6), nasopharynx ( n = 4), oral cavity ( n = 2), and one with unknown primary and secondary neck node. All patients underwent routine staging work-up. FDG-PET and CECT scans were performed with dedicated PET-CT scanner in single session as a part of the radiotherapy treatment planning for Intensity modulated radiotherapy/Image-guided radiotherapy. Results: All patients had abnormal increased uptake in PET-CT scans. PET-CT resulted in changes of CT-based staging in 8 of 26 patients (up-staged in 7 and down-staged in 1). The mean primary and nodal GTV volumes on PET-CT and CT were significantly different (primary: PET-GTV: 48.43 ± 53.21 cc vs. CT 54.78 ± 64.47 cc, P < 0.001; nodes: PET-GTV: 12.72 ± 15.46 cc vs. 11.04 ± 14.87 cc, P < 0.001). The mismatch between two target volumes was statistically significant ( P = 0.03 for GTV primary, P = 0.04 for GTV node). Conclusion: Accuracy of delineation of GTV can be improved along with functional imaging using [18F]-FDG. These metabolically active volumes are significantly smaller than CT-based volumes and could be missed during conventional CT-based target delineations of GTVs. 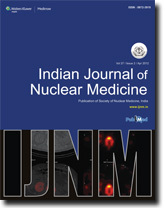 Purpose of the Study: It is proposed to fill in the gaps in the existing data matrix of mass/volume of uterus, its contents as well as mass of fetal organs by mathematical techniques down to 6 week gestation and relate this dynamic target mass during in-utero growth to recently revised Medical Internal Radiation Dose (MIRD) 21 schema. Materials and Methods: The existing data is subjected to numerical interpolations using a standard 4 degree polynomial for certain set of variables. Interpolations of mass, volume, etc., of various components of the uterus (placenta, embryo/fetus, brain, uterine wall, etc.) at weekly/biweekly intervals have been carried out. Subsequently, the step wise regression starting with three predictors - placental mass (W p ), total fetal mass (W f ) and greatest length (H) for the augmented data set led to identification of "H" and "W f" as the most significant predictors for 10 fetal organ masses W i using standard software "MS Excel." Results and Discussion: Further analysis utilizing allometric equations reveal that there is strong evidence in favor of W f compared to H for predicting (P < 0.001) the individual organ mass "W i". The prediction of W i -liver, heart, thymus, pancreas, and thyroid fall under the linear case of prediction (predictor is ln [W f ]); whereas the brain, lung, kidney, spleen, crown-heel length, etc., fall under linear-quadratic case (where ln (W f ) plus [ln (W f )] 2 ) are the predictors) respectively. The estimates indicate a rapid decline of "brain mass/total mass" ratio from 80% to 39% during 7-9 weeks. Information on specific absorbed fraction Φ (=φ/m T ) is required to arrive at the dose estimates (φ being the absorbed fraction). The very small target mass m T -few milligrams (for 90% of organs) to a maximum 11 g for brain during early pregnancy; the fetal thyroid, with its mass variation of about 300% during 10-13 weeks can impact Φ. Reported standardized doses are presented and variation of Φ with source-target distance for individual specific scaling of Φ is discussed. Conclusion: Time dependent mass m (t) of the target and consequently Φ(t) [=φ(t)/m T (t)] of the revised MIRD dose expression can be of relevance in fetal dosimetry when source-target distances are in reasonable limits. 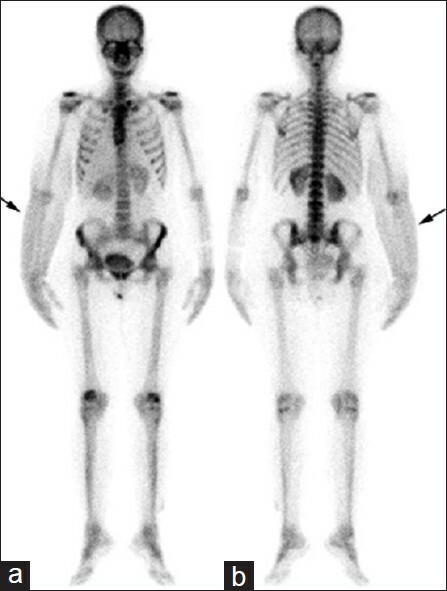 A 42-year-old female patient with a past history of right breast cancer and recent onset swelling of the right forearm underwent routine whole-body bone scintigraphy with Tc-99m methylene diphosphonate, 2 years after a modified radical mastectomy. Diffuse soft tissue tracer concentration was seen in the right forearm. Subsequent lymphoscintigraphy using Tc-99m sulphur colloid revealed obstructed lymphatic drainage in the right upper limb. Parathyroid adenoma is the most common cause of primary hyperparathyroidism. 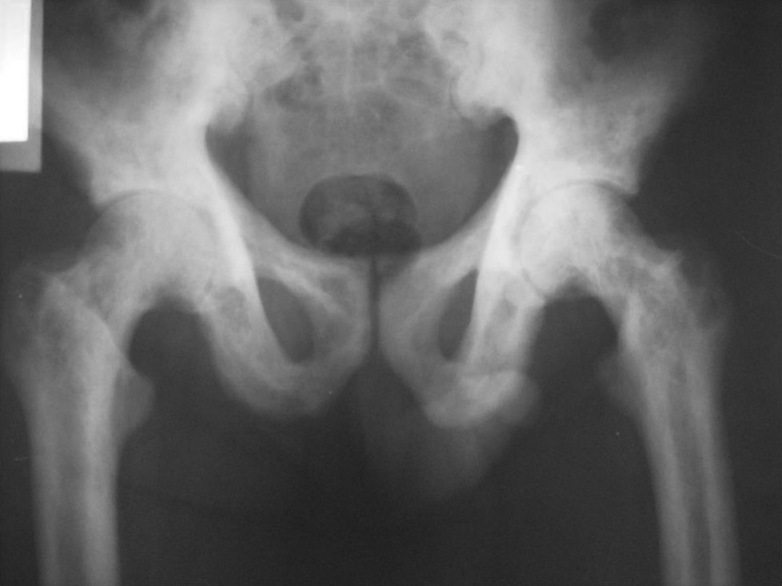 Severe cases of primary hyperparathyroidism manifest as osteitis fibrosa cystica generalisata, characterized by generalized bone loss with increased bone resorption, including both subperiosteal and endosteal surfaces. The most common sites for formation of fibrotic cystic lesions (brown tumors) are in the long bones and jaw which present as swelling, pathological fracture, and/or bone pain, usually involving multiple sites. Here, we describe an unusual presentation of a solitary brown tumor in a young male who initially presented to the hand surgeon with a history of right thumb swelling following trivial trauma. Further detailed clinical, biochemical, scintigraphic (Tc 99m methylene diphosphonate scintigraphy and Tc 99m Sestamibi scintigraphy), and radiological investigations aided definitive diagnosis and treatment. The causative parathyroid adenoma was excised curing hyperparathyroidism and the lesion regressed substantially. With technological advancements and wider availability of multimodality imaging, incidental lesions are frequently identified in patients undergoing various imaging studies. 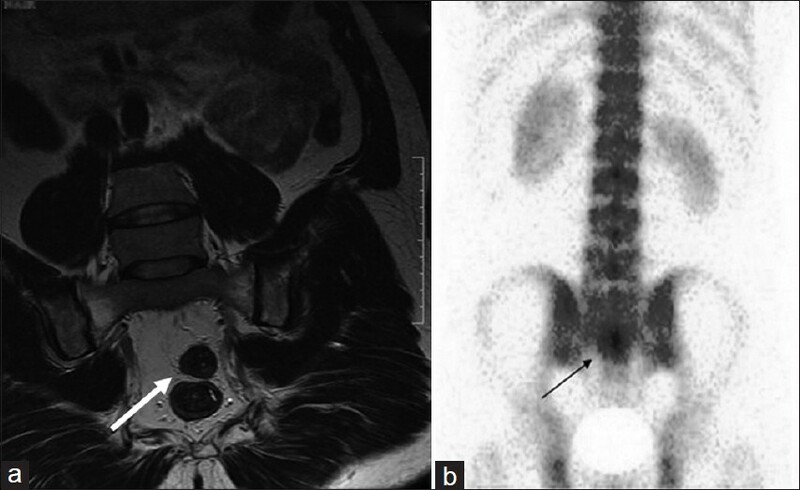 We report here a case of multiloculated disseminated perineural or Tarlov cysts (TCs). The primary aim of this case study was to (1) provide a comprehensive review of the clinical, imaging, and histopathological features of TCs (2) to draw attention to the fact that multiple lumbosacral and dorsal TCs can produce nerve injuries and serious movement disturbances, and (3) to document the usefulness of the magnetic resonance imaging and bone scan in non-invasive diagnosis and guiding management in such cases. These cysts are clearly identified by magnetic resonance imaging (MRI) and computerized tomography imaging of the lumbosacral spine. However, there are no reports on the scintigraphic findings of multilocular disseminated TC in literature. TCs are typically benign, asymptomatic lesions that can simply be monitored. To date, no consensus exists about the best surgical strategy to use when indicated. 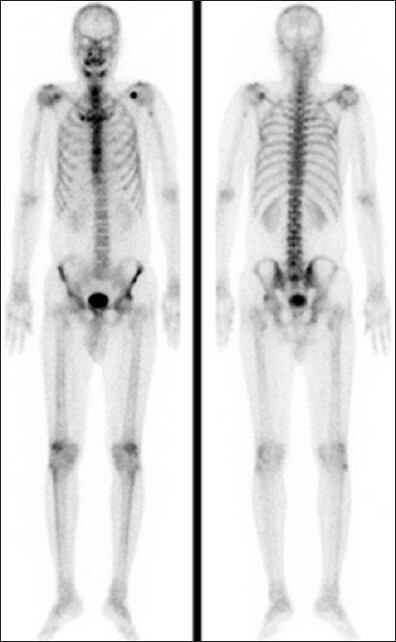 We report F-18 fluorodeoxyglucose (FDG) "positron emission tomography (PET) super scan" akin to "super scan" of conventional skeletal scintigraphy, in a rare case of primitive neuroectodermal tumor (PNET) of the kidney. 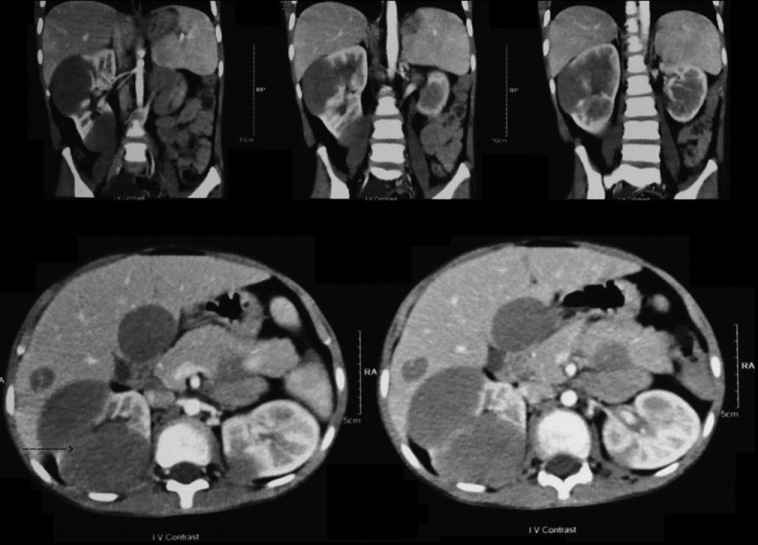 A twelve year old male patient of metastatic PNET of the kidney was subjected to a "true" whole body F-18 FDG PET scan including lower limbs and skull region as per the institution protocol. The images revealed extensive hypermetabolic areas corresponding to the computed tomography described renal, hepatic, and pancreatic lesions along with intense and non-uniform uptake in the marrows of axial and appendicular skeletal system. Interestingly, low background tracer concentration was observed along with very low F-18 FDG uptake in the brain, skeletal muscles of limb, mediastinum, and bowel. 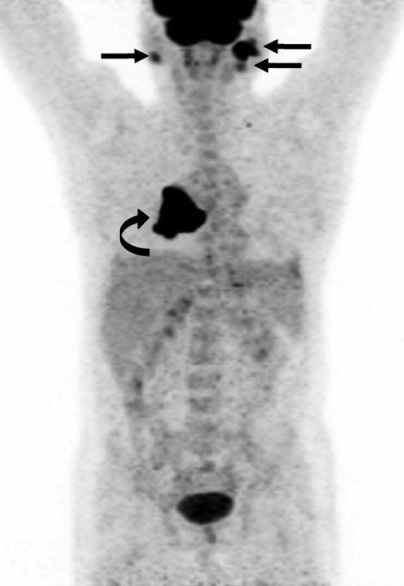 In view of these findings, the scan can be interpreted as "PET super scan" due to its resemblance with the super scan of skeletal scintigraphy. A repeat F-18 FDG PET scan after chemotherapy revealed marked treatment response with disappearance of "super scan"-like pattern, reduction in number, size, metabolic activity of the lesions, and stimulated marrow sans the previously diseased portion. Though uncommon, the reporting physician should be aware of "PET super scan" and its implications as described in this case. Von Hippel-Lindau (VHL) syndrome is a hereditary autosomal dominant disorder caused by defective tumor suppression gene at 3p25-p26. The gene for VHL disease is found on chromosome 3, and is inherited in a dominant fashion. The VHL gene is a tumor suppressor gene. This means that its role in a normal cell is to stop the uncontrolled growth and proliferation. It is characterized by abnormal growth of blood vessels. It strikes the eyes, central nervous system, kidneys, endocrine glands, etc. It predisposes the patient to retinal angiomas, central nervous system hemangioblastoma, renal cell carcinoma (RCC), pheochromocytomas, islet cell tumor of the pancreas, endolymphatic sac tumors, renal, pancreatic, epididymal cysts. We present a case of familial VHL syndrome whose Fluorine 18-fluorodeoxyglucose positron emission tomography-computed tomography scan was truly positive for adrenal pheochromocytoma but was falsely negative for RCC. Review of literature related to this entity is made. Primary hyper-parathyroidism is attributed by a solitary parathyroid adenoma in 80-85% cases and mostly are non-palpable and needs imaging for localization. Cystic degeneration of parathyroid adenoma is rarely seen in primary hyperparathyroidism. We are presenting a case of giant cystic functioning parathyroid adenoma with associated localized co-morbids. Thyroid ectopy is characterized by the presence of thyroid tissue outside its normal position resulting from a defect of the thyroid diverticulum migration from the base of the tongue until its final pre-tracheal position. One case is presented in a 12-year-old girl patient who consults for a failure to thrive estimated at less than three standard deviations (SD). Bone age was estimated at 8 years late compared to chronological age. The hormonal assessment showed hypothyroidism with negative thyroid antibodies. Cervical ultrasound was revealed thyroid parenchyma pre-dominantly left in place while sweeping the area under chin showed a nodular formation of the base of the tongue. Thyroid scan with technetium 99 m showed a selective uptake of radiotracer in sublingual position. Cervical computed tomography revealed a posterior median sublingual mass spontaneously hyperdense and enhancing sharply after injection of contrast. Treatment with thyroxine allowed obtaining euthyroidism. This case asks us to be careful before aetiological diagnosis of hypothyroidism in children, because although this is rare, the presence of a thyroid parenchyma up to the cervical ultrasound does not eliminate the presence of ectopic tissue. 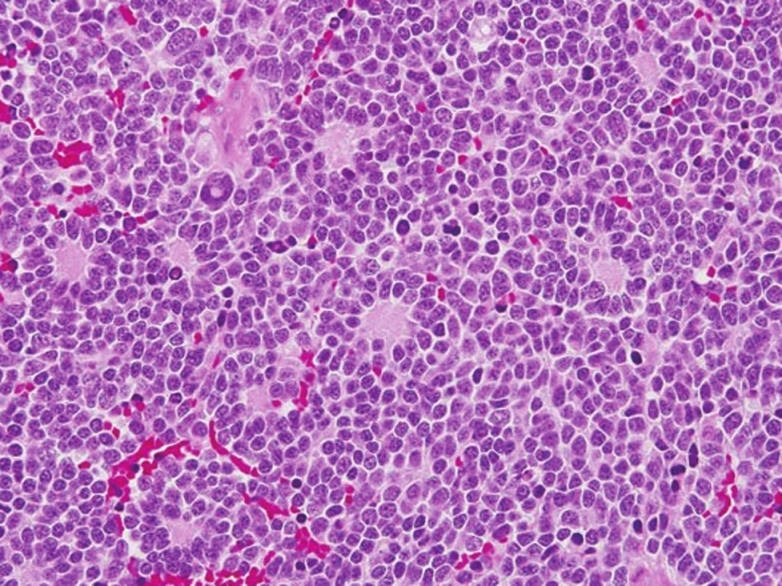 The clinical presentation of ganglioneuroblastoma is highly variable and it is not uncommon to see metastasis at presentation. Bone is the second most common site of metastasis in neuroblastoma. Neuroblastoma cells usually activate osteoclasts and form osteolytic lesions. Here, we describe a patient who presented with back pain. 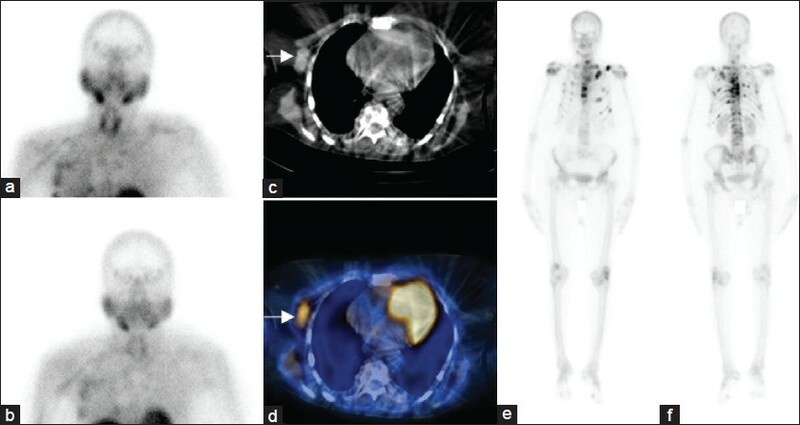 On evaluation, X-ray and positron emission tomography-computed tomography showed mixed lytic and sclerotic vertebral metastasis, and subsequently diagnosed as ganglioneuroblastoma. Sarcoidosis is a systemic, granulomatous disorder that affects multiple organ systems, but most often the lungs and the skin. The incidence of radiographically evident osseous involvement is between 1% and 13%, with an average of 5% on conventional imaging. 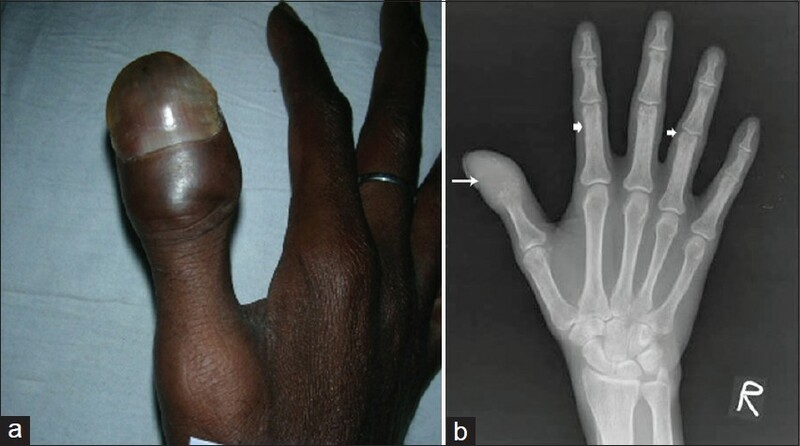 Sarcoidosis generally involves the peripheral skeleton with the phalanges, metacarpals, and metatarsals being most frequently affected. The majority of osseous lesions occur in the phalanges of the hands. Involvement of the axial skeleton is rather uncommon. Sarcoid bone lesions are usually asymptomatic. 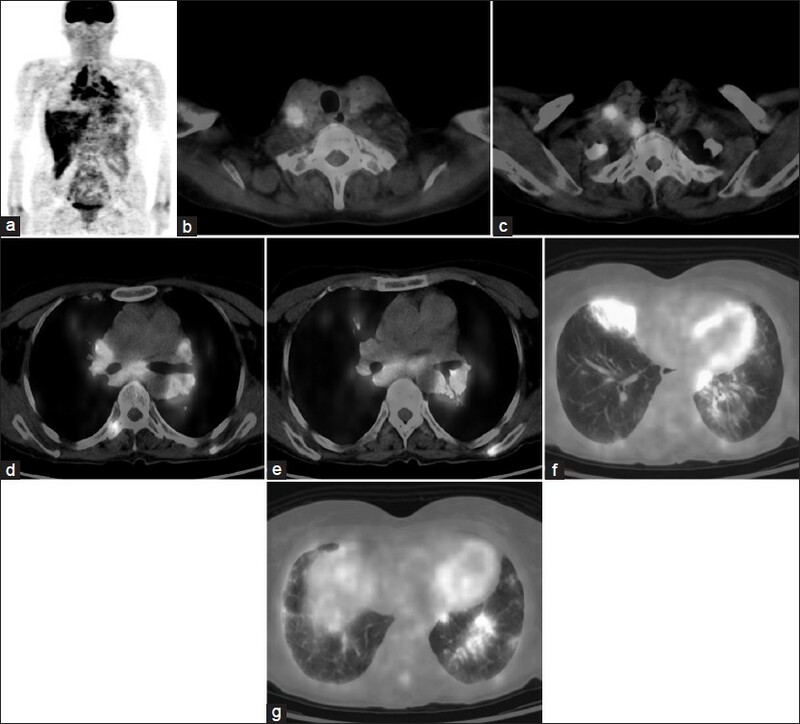 Nuclear medicine studies, in particular bone scintigraphy, gallium-67 (Ga-67) and F-18 fluoro-2-deoxyglucose positron emission tomography (F-18 FDG PET) have been used in staging of sarcoidosis, including assessment of extrapulmonary involvement. Here, we present a case of osseous sarcoidosis in a man whom the disease presented with multiple lesions in the axial skeleton and the long bones.